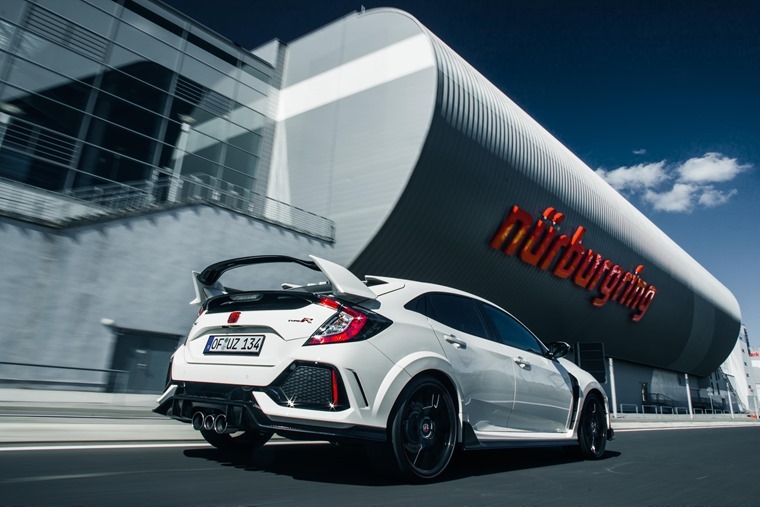 Honda Civic Type R sets new Nurburgring record: A cause for celebration or concern? Developing a new car takes several years, millions of pounds and many thousands of hours of driving to create something right for the road. So, why then do car companies devote so much of their effort telling us how quickly their latest prodigy will crack around the Nurburgring? Certainly, there’s an element of kudos to be had in lapping the 20.8km Nordschleife in anything approaching a rapid time for whatever class of car you’re selling. Anything under 8 minutes is widely regarded as pressing on at a fair rate whatever type of machine you find yourself in. So, Honda’s new Civic Type R recording a new front-wheel drive production car record of 7 mins 43.8 secs is impressive. Perhaps just as important for the Japanese firm, it wrests the title back from Volkswagen, who had the impertinence to beat it with the Golf GTI Clubsport S.
And there’s the rub with this type of benchmark. Volkswagen, and Renault before them, came up with limited number special editions to crack this coveted gong. At least the Civic Type R in both its incarnations has been a factory standard car, albeit with additional safety equipment installed for understandable reasons. 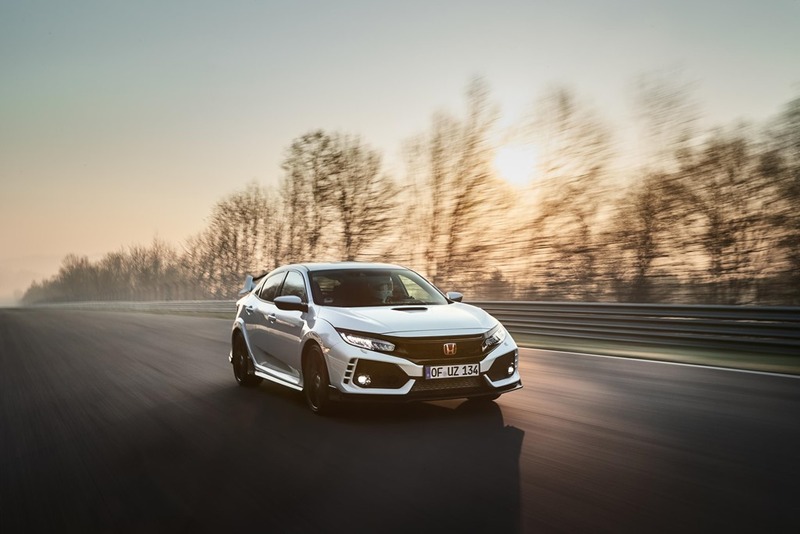 Even so, Honda has been careful to make sure the Type R gained no structural advantage from the roll cage and the extra weight was offset by removing the infotainment system and rear seats. 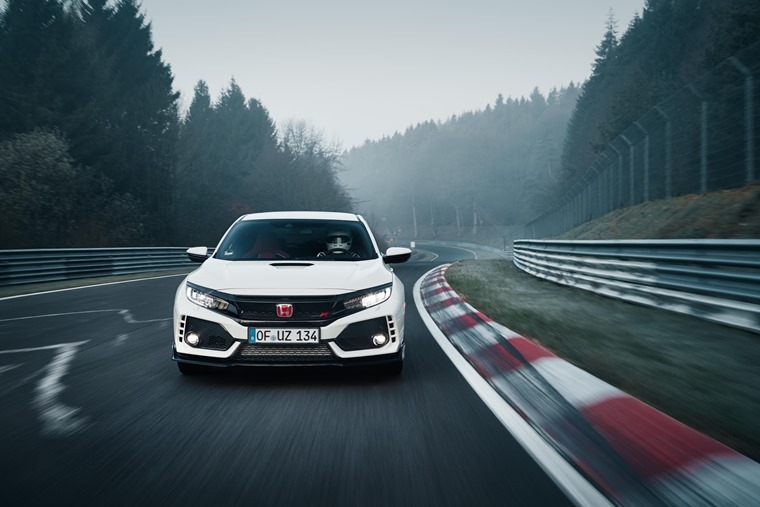 Now, the fact we’re talking about Honda raising the bar for front-drive production cars around the Green Hell means the company has achieved its PR goal. But what does it mean for us drivers who will spend most of the time using this car on the road, and that’s assuming a small number of owners will venture on to track days with their brand new hot hatch? 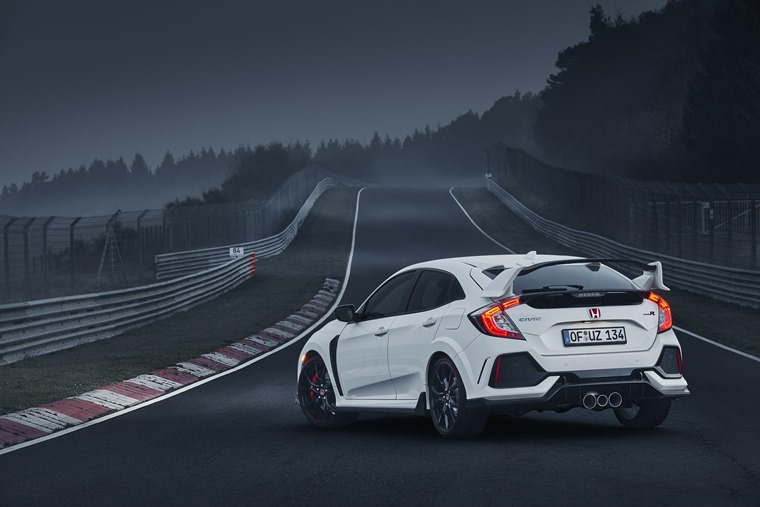 Well, there’s a degree of bragging rights that comes with this kind of lap record and it also shows the Civic is undoubtedly a very quick car in a straight line and, more importantly, around corners. To design a car with this sort of record in mind, even remotely, can influence the way the car is set up to the detriment of its on-road manners. None of this matters when the likes of Porsche, Aston Martin and Radical go chasing lap records. They are out and out sports cars with the sole intention of delighting their drivers every time they’re taken out for a jaunt. Owners will put up with all manner of discomfort for the thrills these cars can deliver. And a lap record at the ‘Ring only adds to their appeal and reputation. With hot hatches like the new Civic Type R, the case is much less open and closed. To design a car with this sort of record in mind, even remotely, can influence the way the car is set up to the detriment of its on-road manners. 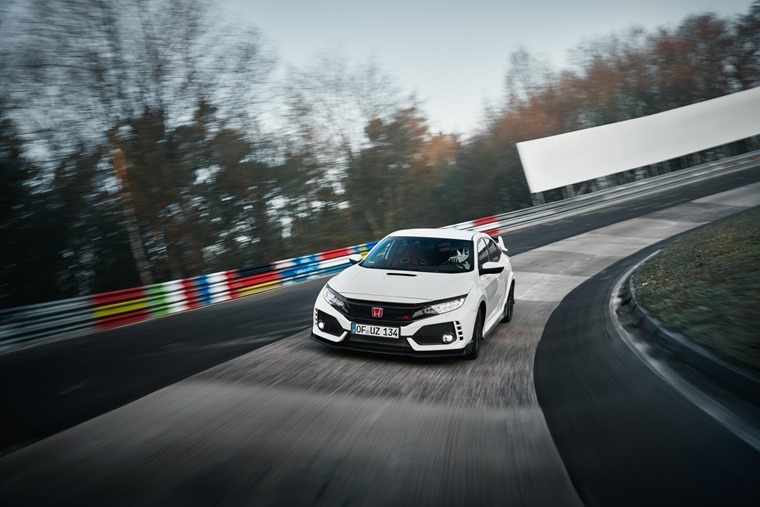 Now, we’re not suggesting for a moment this is the case with the Civic Type R as we’ve yet to drive it – you can find out what we think when we get behind the wheel in the middle of June – but what we can say is that experience of cars launched with the PR line ‘developed at the Nurburgring’ is a cause for as much caution as celebration. The danger comes when some car makers get a little too obsessed with taking records at the Nurburgring. The reasons for that are simple. Driving a performance car hard on the road with you or me doing the work is nothing like going flat out round a track with a professional driver at the wheel. Road cars have to deal with many more variables in surface, traction and steering than on any circuit. If the Civic can get round Metzgesfeld 10km/h faster than its rivals, it should have no trouble with the local ring road. Conversely, track driving puts far more strain on the suspension, brakes, tyres and chassis, so it’s a good way to highlight any weaknesses in these areas before a car is unleashed on the general public. The danger comes when some car makers get a little too obsessed with taking records at the Nurburgring. This is what happened with the Golf GTI Clubsport S. Great as it is, the only people really interested in this sort of car are collectors who can sidestep the issue of it only having two seats and the fact it’s not as good in the real world as a Golf R.
Again, we don’t know if this is the case with the new Civic Type R as we haven’t driven it yet. 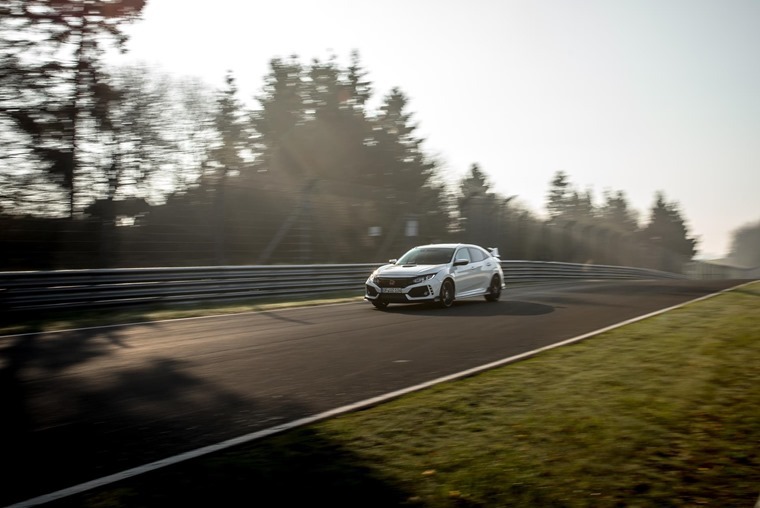 Absolutely, we’re looking forward to the opportunity and all the signs are it’s still a car with a keen focus on road driving rather than going down to track route that marked out the Golf Clubsport S and Renault Megane Trophy-R. Hot hatches are all about having fun on the road at the sorts of speeds that keep your licence intact. Perhaps what we should take from these stunts by car companies is the more swiftly a car gets round a track like the Nurburgring, the bigger its margin of ability on the road when being driven by those of average ability. After all, if the Civic can get round Metzgesfeld 10km/h faster than its rivals, it should have no trouble with the local ring road. 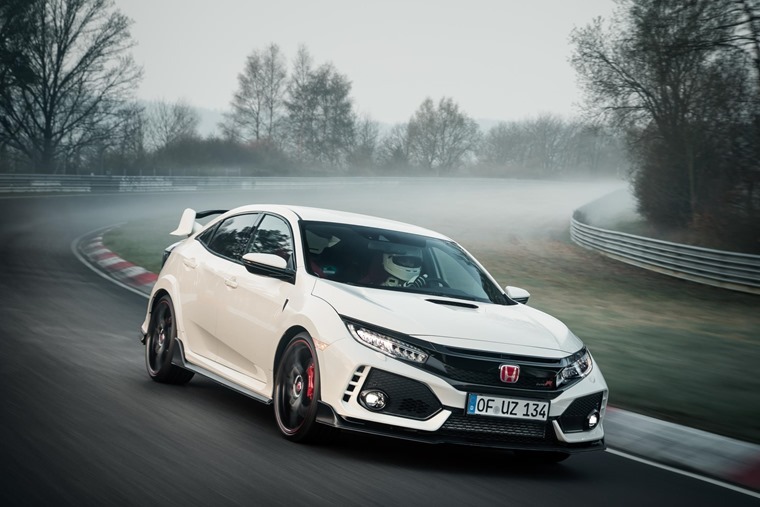 None of this is to underestimate or take away from Honda’s success with the new Type R in raising the bar in the front-wheel drive class record. Our only hope is this doesn’t develop into the arms race that witnessed a temporary ban on this kind of lappery following a fatal accident during a race at the German circuit. After all, hot hatches are all about having fun on the road at the sorts of speeds that keep your licence intact. The joy of these cars is they can commute, do the school run, take you to the shops, carry the mother-in-law and yet still plaster a smile on your chops when the opportunity arises. Stray too far from this all-round ability and a hot hatch quickly becomes too focused, flabby or – whisper it – boring. 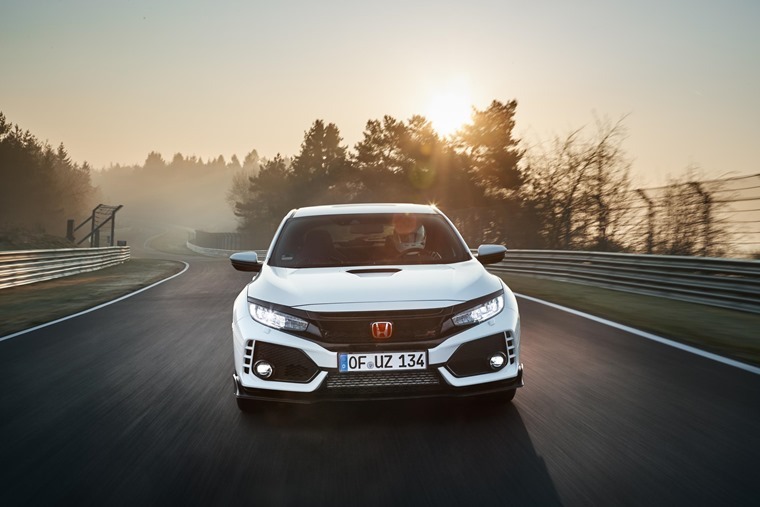 The chances of any of that happening with the Honda Civic Type R are very remote, which is why we can’t wait to try it out. On the road. Relay car theft: What is it, how can you prevent it, and will your car insurance cover it?